Charlotte Gistelinck, PhD, Ronald Kwon, PhD, David Eyre, PhD, and Mary Ann Weis worked with researchers from Ghent University in Belgium to assess the extent to which human type 1 collagenopathies are repeated in mutant zebrafish. 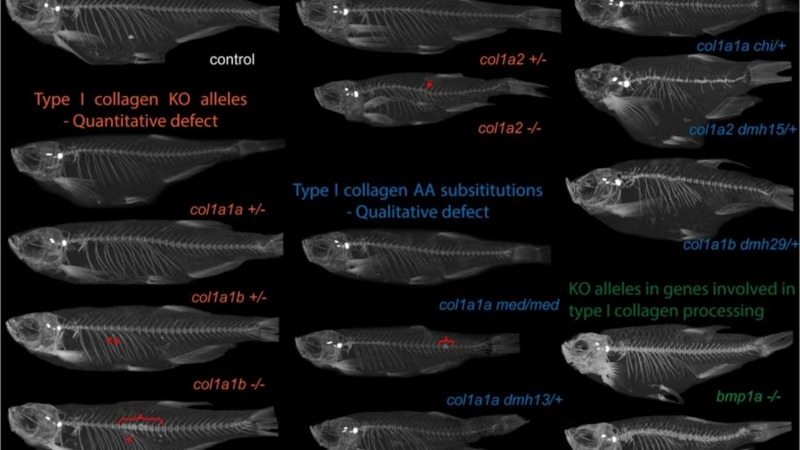 In this study, several genetic mutations and modifications were introduced in zebrafish, as seen in patients with different forms of classical Osteogenisis Imperfecta and Ehlers-Danos Symdrome. These "mutated" zebrafish exhibited remarkably similar features as human patients, such as fractured ribs, bowed bones and facial deformities. The similarities in the progression and development of the disorders in the mutated zebrafish and humans illustrates the future potential of zebrafish as a tool to further explore collagenopathies in humans, improve diagnostic strategies, and accelerate the development of new candidate drugs. An important advantage of these zebrafish models compared to laboratory mice is that they are much easier, much more efficient and much cheaper to work with. Zebrafish are also faster to breed and can produce up to 300 eggs in one breeding. These advantages together with this study's findings can strongly reduce the number of experiments needed in mice, which is currently the main animal model for the study of skeletal development. Results of the study have been recently published in the Proceedings of the National Academy of Sciences (PNAS).